JRPG Jungle: An E3 2016 Summary for the JRPG Fan! E3 2016 was full of a lot of great surprises, conferences and games and a nice, big handful of them were JRPGs! As I mentioned last year, Tokyo Game Show is usually a better show for JRPG fans, but nonetheless E3 usually has a few major JRPGs mixed in, this year being games such as Final Fantasy XV and Persona 5. It took me about a week to catch up with all the news and announcements and that's because there's a lot to be excited about being released, which you can read about in this article. The next game in the Akiba's Trip series Akiba's Beat was announced for PS4 and PS Vita and is set to come out later this year in Japan and North America. Set in Japan's Akihabara, Akiba's Beat is a new story about the town being stuck as a Sunday and uncovering the delusions and mysterious surrounding this phenomenon around town. Replacing the 'Strip' mechanic in Akiba's Trip is a music based mechanic, which allows the music used in battle to effect your power level. I enjoyed Akiba’s Trip: Undead and Undressed a bit, but never felt compelled to finish the game. Akiba’s Beat however looks much more up my alley with it’s dungeon crawling and more RPG-based elements. Also, the replica of Japan’s Akihabara looks as fantastic as it did in the last game and I was also intrigued by the new, colourful-looking dungeons in the game. You can watch the trailer for Akiba's Beat below. Dragon Ball Xenoverse 2 was announced in May 2016, so Bandai Namco showed off a cool gameplay trailer showing Turles and Future Gohan battling it out in typical Dragon Ball Z style, showing the characters flying around and shooting big, dramatic attacks at each other. My experience with Dragon Ball Xenoverse is kind of low - I played a bit of the Xenoverse beta a few years ago and wasn't really moved by it - but the gameplay in the trailer looks very smooth, so I'm sure fans of Dragon Ball Z and Xenoverse will be excited to play this. You can watch the trailer below and also a Gamespot interview with Xenoverse's producer. Final Fantasy XII The Zodiac Age had a small presence at E3, mostly allowing selected people to play the game and having a few interviews, including one mentioning that the PS4 version will feature a fast-forward feature for easy level grinding and map exploring. I mostly enjoyed the game footage below for Final Fantasy XII The Zodiac Age from PlayStation Access, as it shows just how nice the game looks on PS4 and also how faithful it is to the original PS2 game. Final Fantasy XV got a lot of major coverage during E3, being featured in two major conferences in different ways. Microsoft showed off a cool boss battle from XV with live gameplay, while PlayStation showed some footage with dubstep music, then announced Final Fantasy XV VR Experience. 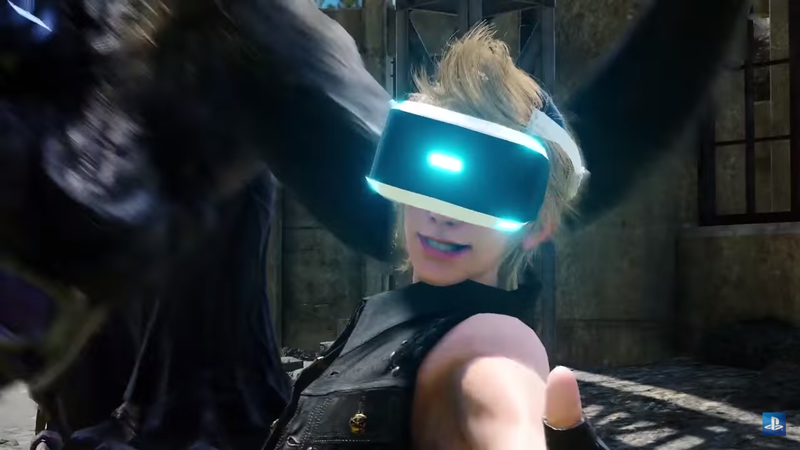 The VR Experience will let players play as Prompto in what Hajime Tabata described as a more DLC-like separate experience. I can't say I was expecting a VR version of Final Fantasy XV but it's definitely an interesting development in the Final Fantasy XV Universe and made me consider picking up PlayStation VR at some point. It was also revealed during E3 that the home console version of Final Fantasy XV boasts 40-50 hours of gameplay in the main story and doing quests can bring that up to over 100 hours. Also shown off was a new, stunning trailer of the Final Fantasy XV movie, Kingsglave Final Fantasy XV. Seriously, if Square Enix can do anything, it's stunning visuals like what was shown in that trailer. The story of Kingsglave hasn't excited me that much yet, but seeing some of the scenes featuring monsters in the trailer was pretty cool, as well as seeing a little of what will be explored in the story. What I liked seeing most during E3 for Final Fantasy XV was more of the combat and world shown in interviews and gameplay videos. I particularly liked how the combat gameplay shown by Gamespot showed explosion-level fire magic, teleportation and even the party looking like they’re strategising with Noctis before battle, something I don't think I've seen in a Final Fantasy game before in that way. I also found it interesting that the actions in battle seemed to affect everyone, such as Noctis using a giant fire spell while the other characters are near the enemy and them expressing pain because, well, fire. More footage that showed great visuals was Gamespot's interview with Hajime Tabata, where they showed a lot of the world and what seemed like continuous gameplay at points, with Noctis running through towns and a few cutscenes occuring. You can watch these videos below. A cool trailer was shown for the fun-looking Gravity Rush 2. As a big fan of the original Gravity Rush game (I platinumed it! ), I was happy to see how nice and smooth the game looked, especially when compared the original Gravity Rush game for PS Vita. It very much look like the same gameplay I loved from the original, but prettier and with a new story, which is exactly what I want. Some great gameplay footage was shown during an IGN interview with people from Japan Studios. Along with talking about the development process, they also showed and talked about new aspects of the game, such as the new Lunar and Jupiter style gravity, making Kat fly through lighter or heavier gravity respectively. You can watch the fun looking gameplay in the videos below. In the pre-E3 hype period, Square Enix dropped a new, beautiful trailer for Kingdom Hearts HD 2.8. The trailer shows clips from all games making up 2.8, including new parts of the story Birth by Sleep 0.2 and χ Back Cover, along with footage from Dream Drop Distance, which I’m keen to finally play because I didn’t have a 3DS when it was originally released. The whole trailer was very intriguing, but the part I was most intrigued by was the footage from χ Back Cover. χ Back Cover is said to give the backstory of the keyblade, something Kingdom Hearts hasn’t really explored in depth so far. That part of the trailer featured a different aesthetic and had a lot of interesting story moments and conflict, so I'm very curious to see more. Kingdom Hearts HD 2.8 is a game I’m definitely going to get when it comes out, considering I haven't played any parts of this and is sure to be a great primer for Kingdom Hearts 3. This trailer was released quite early for even a pre-E3 trailer, but nonetheless shows some of the translation and gameplay of Tokyo RPG Factory's I Am Setsuna. I Am Setsuna is based on old style JRPGs, so the trailer doesn't feature crazy 3D visuals, rather a beautiful modest art style that is a great combination of the old way JRPGs were featured on 2D maps with a 3D twist. With it's beautiful music, nostalgic feeling and emotion sounding story, this is a game I'd love to try. The trailer is below and the game is already out in North America. A new trailer was revealed for the popular Trails of Cold Steel series, The Legend of Heroes: Trails of Cold Steel 2. The trailer and traditional JRPG feeling definitely spiked my curiosity, although I can't save I've played the first Trails of Cold Steel yet. Since the first game in the series has really good reviews, I'm hopeful the second game will live up to fan expectation. You can watch the E3 trailer below. Last year, a new NieR project was announced, so it's exciting to see a trailer for NieR: Automata this E3. The original NieR PS3 game is currently sitting in my backlog, so I can't say I know that much about the series, other being interested in the music and style of the game. The trailer for NieR: Automata features an intriguing style, world and story premise which you can see in the trailer below, along with an extended look at a boss battle with the boss shown at the beginning of the E3 trailer. Atlus casually broke a bunch of JRPG fan’s hearts in the name of quality during the pre-E3 hype period. In an official announcement via a blog post on PlayStation Blog, Atlus announced that America will see Persona 5 on Valentine's Day 2017. I’d love to be mad about this, but I’m kind of glad they’re doing this because choosing between Final Fantasy XV and Persona 5 in September was an extremely difficult decision and they kind of chose for me. Also, Atlus’ localisations are always high quality and if they need to take time make Persona 5 the best quality possible, I’m okay with that. With the whole ‘Take Your Heart’ theme around Persona 5, I love how fitting Valentine’s Day is for the release date. During E3, Atlus showed around 8 minutes of Persona 5 gameplay footage, with the same footage being broadcast to Japan via a NicoNico stream. It showed some of the day and night life, which showed the protagonist hanging out with friends, eating places and working part time jobs such as at the convenience store. Then dungeon footage was shown where you could see the party fighting and some of the seamless looking battle system, complete with a lot less load screens and cool all-out attack animations. I was really pleased with this footage and if it’s anything to go by, it’s exactly what I want from Persona 5 - a bigger version of the gameplay Persona is known for in an interesting environment and with Persona's usual great stories. The stream also showed a new party member and some new 'Cooperative Characters' that are meant to help out. You can watch this footage below (the gameplay starts around 13 minutes, the new party member is shown around the 7 minute mark and the cooperative characters are shown in the last few minutes of the stream). Atlus also showed a fully translation version of the recent gameplay trailer. This is noteworthy because it gives an idea of what the localisation will be like and so far it seems well written and showed the personalities of each character. This can be in the video below. During Nintendo’s Treehouse Live event, Nintendo showed off a good amount of gameplay (over 30 minutes worth) of Pokemon Sun and Moon. The gameplay was very similar to other Pokemon games as usual, but I enjoyed the updated visuals and the nice tropical world of the Alola region Pokemon Sun and Moon is set in. There were a few new Pokemon shown, although that didn't have too much of an impact on me since I lost track around the 300 Pokemon mark, and also some new animations for the trainers which gives them more personality in battle. What interested me most was the Battle Royale mode where players can play with four people, which will be a fun new way to battle friends with Pokemon. You can watch the E3 demonstration and interview below. Amidst all the Persona 5 hype, Atlus also released a trailer for Shin Megami Tensei 4: Apocalypse. This is an interesting game to see at E3 as while the trailer had some great animation and cool looking gameplay, some of the battle animations looked a little simpler compared to all the crazy graphics in other trailers. Nonetheless, the music and monsters in this trailer were very cool, so since I want to try more of the core Shin Megami Tensei series I'll be keeping this game in mind. You can watch the trailer below. A lot of footage for Star Ocean: Integrity and Faithlessness is already available online because it’s already out in Japan, but it was nice to hear the English voice acting cast for the first time in the new trailer for Star Ocean: Integrity and Faithlessness. The art looks beautiful and the huge looking world definitely makes me want to try this game. Also released was a Meet the Voices trailer, which gave a good insight into the characters from a different perspective, along with showing off the great talent who will be featured in the English dub. You can watch these great trailers below. This trailer for Tales of Berseria was honestly one of the biggest E3 surprises to me, not because it was shown, but because of how amazing the trailer was and how much it made me want to play this game. If the trailer is anything to go by, Tales of Berseria’s story looks full of action and dynamic, with a lot of strong characters with purpose. When I saw Tales of Xillia’s trailer (the last Tales game I played), I thought it looked cool but Tales of Berseria’s trailer actually has me pumped and may be something I pick up early next year when it's released. You can watch the trailer below. Since I’m enjoying Fire Emblem: Awakening at the moment and I’m a big fan of the gameplay in Persona, it’s no surprise that I seriously adored the demonstration footage from Tokyo Mirage Sessions #FE. It combines the gameplay from both Fire Emblem and Persona in such a unique way, such as using spells and a battle system very close to what's in Persona, and featuring Class Upgrading systems and characters from Fire Emblem. Not only that, but since I love most games that feature pop stars and Idols, a game with this and two great series is a pretty easy win for me. It also featured some of my favourite Fire Emblem characters like Chrom and Tharja, which I was pleased with and their Mirage forms were a very cool way to make these characters more like the summonable monsters and gods seen in Shin Megami Tensei. This game looks so great that I honestly considered picking up a WiiU to play it (I probably won't because that's expensive, but I really want to play this game!). Also released was a trailer for Tokyo Mirage Sessions #FE with shows more of the cool looking Mirages and gives an introduction to the very Atlus seeming story. You can watch the trailer and the gameplay demonstration below. I’m not well educated on the Touhou series, but the origins to Touhou: Scarlet Curiousity are pretty interesting. It’s a fan-made RPG version of the series, which usually uses a shoot ‘em up style, but some fans enjoyed it enough to make an RPG version that takes the shooting mechanics into an active-battle RPG style. In the E3 trailer for the game, the combat battle with a variety of attack styles and jumping to dodge big attacks in boss battles looked pretty fun, so I’ll be keeping this game in mind. You can watch the E3 trailer below. Another cool trailer released during the pre-E3 hype period was World of Final Fantasy and it definitely got me excited to play it. Seeing all the characters from all the Final Fantasy games together in adorable chibi form was super cool, along with getting a peek at what the two new characters Reyne and Lann are searching for. Since the game releases in October just before my birthday, I really hope I've finished Final Fantasy XV by then so I can play this interesting looking story. You can watch this trailer below. As you can see above, there were plenty of JRPGs to be found at this year's E3 and there's a lot to be excited for, with many cool looking JRPGs being released towards the end of this year and the start of the next. My 5 favourite games of E3 2016 were probably Final Fantasy XV, Persona 5, Tokyo Mirage Sessions #FE, Tales of Berseria and World of Final Fantasy, but honestly, they all look really really fun. It's always an exciting time for games at E3, but I can't believe so many exciting JRPGs were talked about even before Tokyo Game Show! E3 2016 was definitely a good show for most gamers this year and if next year is even half as good, I'll be pretty happy. What was your favourite game of E3 2016? And what do you think was missing this year? Special thanks to trailer and news sources such as IGN, Gamespot, Siliconera, Kotaku, Playstation Access and probably more for your hard work during E3!